The month of May brings more than flowers—especially for the dedicated registered nurses finishing a well-deserved week of recognition during National Nurses Week early this month. Last week was National Women’s Health Week, created by the **HHS Office on Women’s Health in 1991, this event is meant to outlast the week, and put regular checkups and health screenings on the minds of women all over the country. These are a few take-away tips to see you and your female patients through the year in good health. • Schedule a Well-Woman Check-up: RNs are familiar with these appointments, and they can assure their female patients that this annual checkup is a great opportunity to set important health goals: like reaching or maintaining a healthy weight, evaluating lifestyle habits, and using your family history and current age to determine what kinds of health screenings and preventive checkups you should be getting. • Know What it Means to Be a Well Woman: Healthy Careers are based on an understanding that health and wellness is a state of mind; it’s about striving to be as healthy as you can be, a goal that encompasses both physical and mental health. This is achieved through a nutritious diet, active lifestyle, getting enough sleep and managing your stress effectively. • Avoid Unhealthy Behaviors: Smoking, texting when you drive, failing to wear a seat belt or helmet during sports are all unhealthy behaviors that National Women’s Health Week seeks to identify and diminish. • Take Advantage of The Affordable Care Act: Let your patients know that well-woman check-ups are considered a preventive service and must be covered by most health plans at no cost to them. During your well-woman visit, you can receive many screenings free of charge, such as screenings for blood pressure, cholesterol, cervical cancer, and more; if your health care provider says you need more than one well-woman visit in a year, the additional visits are also covered. • Look for a National Women’s Week Meet-up: There is no time limit on getting to know like minded individuals that will walk, run or work-out with you! Travel nurses interested in connecting with other health conscious women, should look into finding a meet-up near them; so far 53 cities are participating in healthy meet-ups across the USA. • Support Health Initiatives that Make Women Healthier: Sister, mother, daughter, friend—these are all roles that women play, and they do it best when they are healthy. Help empower the movement by finding health fairs, group fitness classes, healthy recipes and more. Make Healthy Careers a Priority! 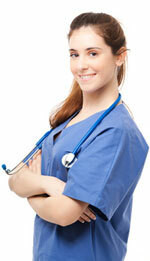 Registered nurses and therapists flourish best in healthcare jobs that let them set their own pace. Discover what it means to tour the United States in flexible travel nurse jobs that can easily turn into something more permanent. YOU make that call! Find out how travel nursing leads to the pursuit of health and happiness by making “I Love Travel Nursing” your mantra! **Information for this article was taken from literature on “National Women’s Health Week”, an observance led by the U.S. Department of Health and Human Services Office on Women’s Health. Next Next post: RNs throughout the Midwest Will Love Ste. Genevieve, Missouri!